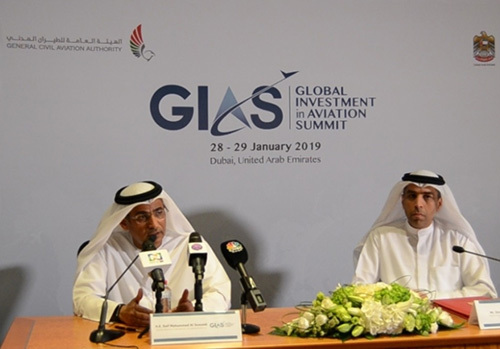 Dubai will host the first Global Investment in Aviation Summit (GIAS), a major aviation conference to be attended by the world’s 500 top aviation investors, as the UAE emerges as the region’s biggest aviation hubs. The two-day summit will be held from 27-28 January 2019. The conference will take place as the UAE authorities are investing AED85 billion (US$23.16 billion) in airport development and expansion that will see its airports handle develop combined capacity to handle over 300 million passengers per year. These include AED30 billion ($8 billion) in developing Al Maktoum International Airport, AED28 billion ($7.6 billion) expansion of the Phase IV of Dubai International Airport, AED25 billion ($6.8 billion) re-development and expansion of Abu Dhabi International Airport – many of which are supported by the banks and financial institutions. In addition Sharjah International Airport is also undergoing a AED1.5 billion investment in expansion of its terminal. “Our airlines and airports have been ranking consistently as among the best internationally. On compliance level, UAE ranked as a top member state of the International Civil Aviation Organization. The Global Investment in Aviation Summit is the UAE’s testament on how far we have achieved and of our commitment to push the nation to be a global pioneer in this field. The glass ceiling is not too high to break as we have mounted unimaginable innovations,” he added. In addition, the four UAE airlines are also investing billions of dollars in acquiring the latest aircraft models that will help the UAE economy to grow. All these developments need funding and the financial institutions and investors are also expanding their capabilities to support the economic growth. The summit is held at a time when the region’s aviation industry rides high on efficiency and performance. Emirates Group posted a profit of AED4.1 billion (US$1.1 billion) for the financial year ended 31st March 2018, up 67 percent from the previous year. Al Suwaidi went on to say that the UAE is the largest airline market and aviation hub in the Middle East and North Africa, adding that "it is still the most vibrant market where the airlines are adding new aircraft every month to their fleet." He said, the Summit will also offer the local market, from within the aviation industry and its related sectors, a great opportunity to expand their business operations from fresh investments generated from the summit. GIAS 2019 will be a specialised and focused gathering where the local market can network with investors to present their ideas and projects. The GIAS will feature International governments investment proposals delivered by key government officials and private sector top executives and will provide attending financiers with a fact and figure checked perspective on ongoing and future projects.